"My hands were trembling. I was anxious and feeling powerful at the same time. And proud, I felt proud." "I took my scarf off because I'm tired of our government telling me what to do with my body." "These protests are done by instigators, saboteurs and vandalists and anarchists." "Recently, our enemies were communists and liberals, now Americans are provoking masochists against us." The Islamic Republic of Iran ideologically requires that Iranian women wear a hijab, a scarf covering their hair. Iranian men, viewing women's hair, much less any exposed body parts not covered by a traditional chador are susceptible to raging hormones that incite in them lustful reactions harmful to the decorum of Islamist society. It is therefore the responsibility of women to ensure that nothing about them leaves the impression in some vulnerable man's mind that she is of loose character and available to his overtures. Since the 1979 Islamic Revolution, Iranian women have transited from appearing in their dress and behaviour like any other 20th-century woman, independent and self-assured, wearing clothing of their choice, to meek and obedient religion-inspired chador-clad women conscious of their duty to their ideologized fascist society to keep the peace by imprisoning themselves within dark fabrics and comporting themselves in a manner complicit with the instructions of the ruling ayatollahs. When the widespread protests began appearing in cities all over Iran late last year, with people in their thousands taking to the streets demanding accountability of the billions that the Republic was spending on the support of foreign terrorist groups, ignoring the upkeep of their own infrastructure, putting people back to work, ensuring sufficient food, heating and water supplies were available, the tenor of the protests became increasingly vocal and bold. 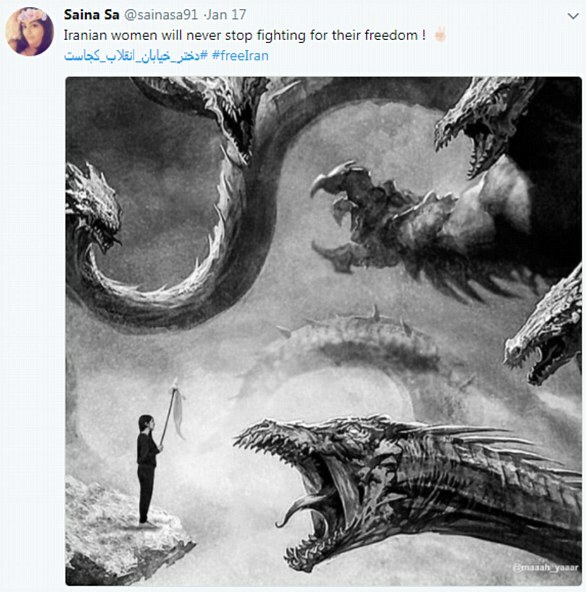 In no small part due to the leadership and activism of Iran's women who on social media platforms urged their male counterparts to be more overtly courageous and lend themselves to the popular sentiments being expressed by the protests demanding an end to the rule of theocracy and an introduction to democratic means of governing the population. That persecution and poverty must come to an end, and women's equality must be recognized as a basic human right. The hijab was seen rightfully as a symbol of the oppression of women by the regime, placing them as appendages of male control in the societal order that was blueprinted by the Iranian Revolution. 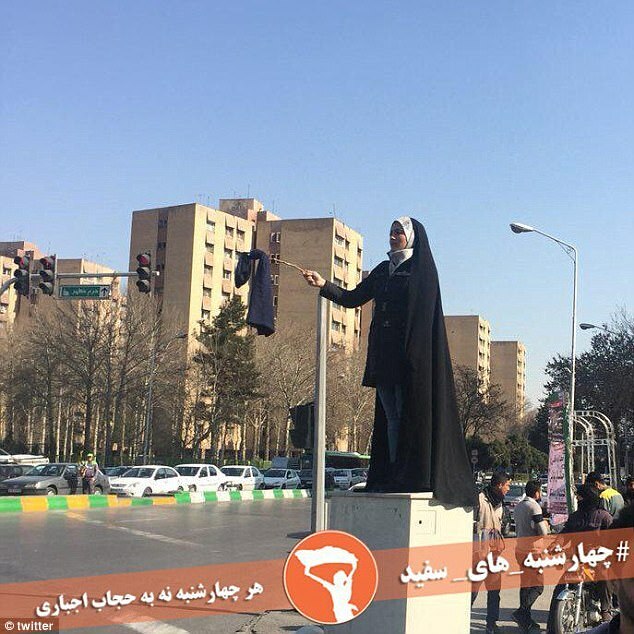 The mass protests may have diminished once the Grand Ayatollah Khamenei dispatched the Iranian Revolutionary Guard Corps to bring 'order' back to the streets and disband the leaders of the protests through arrests and detentions, but the women have renewed their courageous resistance. The original headscarf removal during the riotous days of the protests in full sway brought retribution to the young woman who so distinguished herself by being arrested and incarcerated and kept incommunicado for weeks. She has recently been released, although she has not been in contact with anyone and it isn't clear where she now is. 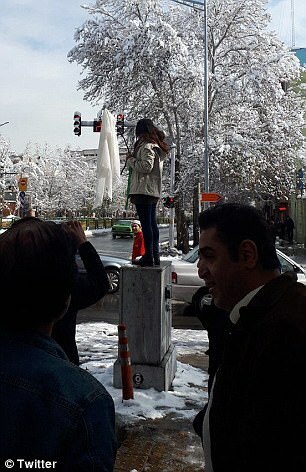 But other Iranian women now mount utility boxes in the squares of Tehran to gain visibility as they remove their hijabs and display them on sticks. These women are applauded by many others, from taxi drivers to older women, all wanting photographs of her and her actions. Six such events have now taken place, according to social media accounts with that notable symbolic gesture taking place; off with the headscarves, onto a stick to be waved about in the jubilation of release. One of those women was arrested, according to a shopkeeper who witnessed her arrest. 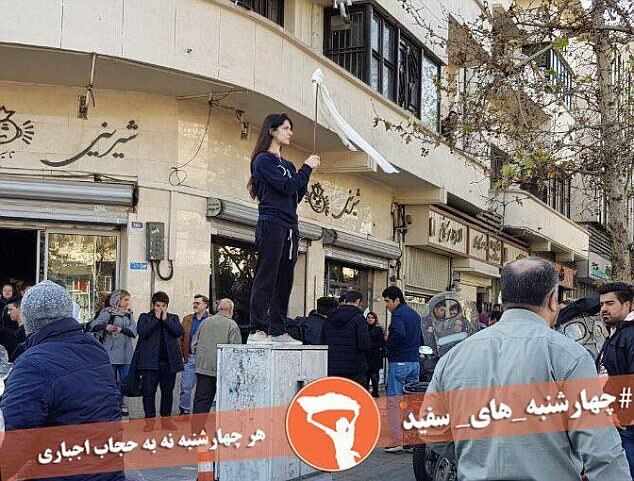 And while the protests are still in their early days of women discarding their hijabs and freeing their provocative hair and their souls, it is entirely possible that a new wave of dissent is on the brink of disconcerting the ruling ayatollahs. It seems that an exiled Iranian journalist's campaign to reach Iranian women on Persian-language satellite television and social media to convince them to discard their hijabs and restore dignity to themselves, is involved in the process. Living in the U.S. now, Masih Alinejad launched her White Wednesday campaign, where women post images showing them removing their headscarves and insisting on an end to the headscarf law. A law reflected as a pillar of the Islamic Republic of Iran. It may very well be a rising tide of female objections to their role as handmaidens to male chauvinist social/religious dysfunction that may ultimately begin another revolution to cast asunder the old one.